Odoo SMS Notification module allows admin to send SMS notifications to the customers/clients for order confirmation, refund, delivery, etc. It provides the means to remain in touch with your prospective client. This module can be used to send a variety of SMS notification which could be varied from business to business. Updating customers through SMS helps them provide customer satisfaction and sustain themselves in the market, staying profitable in the long run. SMS alerts on regular basis help to win the confidence of customers who strive for regular alerts about important notifications such as discount and offer details, payment reminders and new tariffs on their mobile phones. 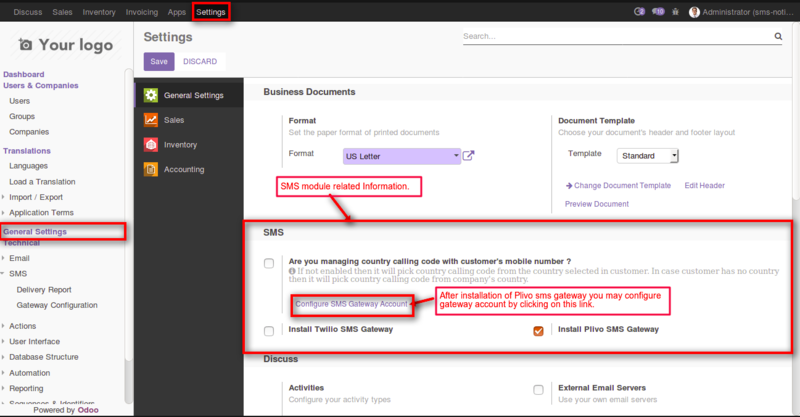 Note: Odoo SMS Notification is a base module for Odoo SMS Plivo Gateway, Odoo MSG91 SMS Gateway, Odoo SMS Twilio Gateway, Odoo ClickSend SMS Gateway To Work on SMS Notification, it is must to have one of these gateway module installed in your addons. This application provides facility to send SMS notification to the mobile number.For sending SMS this application requires an “SMS Gateway”. This is a base module for any SMS gateway (like ClickSend SMS Gateway, Twilio SMS Gateway, Plivo SMS Gateway and MSG91 SMS Gateway). Also provides the SMS history facility. SMS notification will be sent using SMS gateway. Admin can create SMS Template for sending a message. Send a message using templates which are globally accessible. 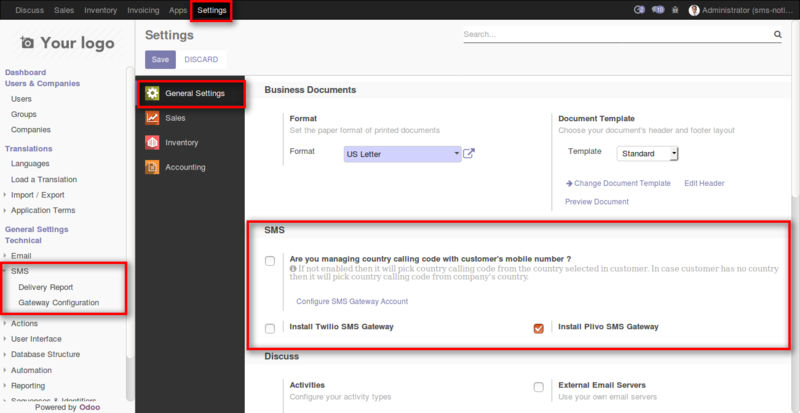 SMS Templates can be configured on the basis of Sale and invoice status that will be triggered automatically. Multiple SMS templates can be sent at a time that will be triggered automatically. If Customer’s mobile number is not set, Customer’s phone number will be used for sending SMS automatically. After buying this app from our Webkul store you will get the link for downloading the zip file. Simply download it and extract then you will see the sms_notification folder, now you will have to copy this app folder inside your Odoo addons path. 3. Remove the app’s filter and search for the sms_notification key. 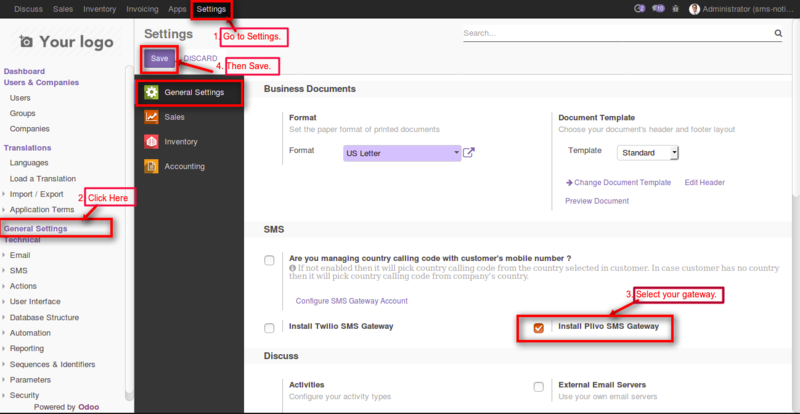 Once Odoo SMS Notification is installed, click on settings menu> under technical tab click on SMS. 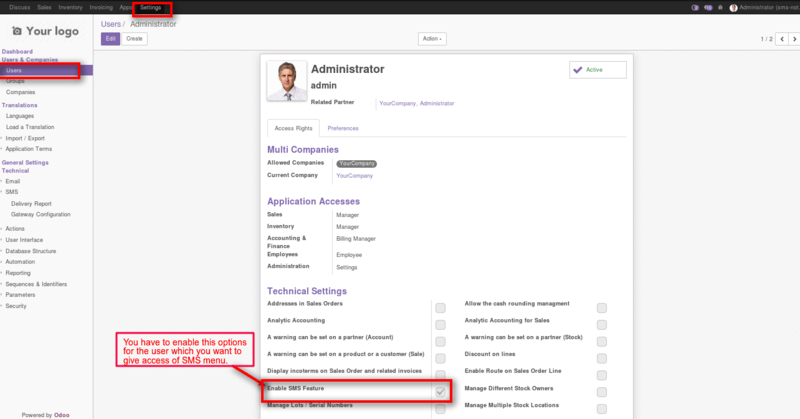 Select any SMS gateway and then click on apply button. By clicking on SMS Gateway link under general settings option, you can directly configure particular gateway settings. 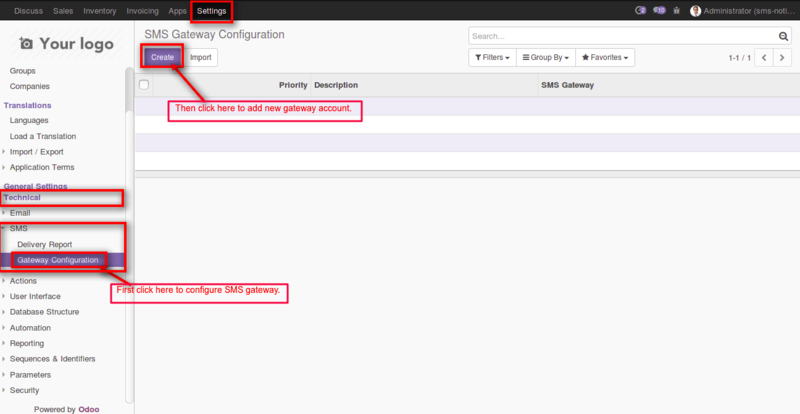 Click on Gateway configuration option under SMS option, to set SMS gateway configuration settings. 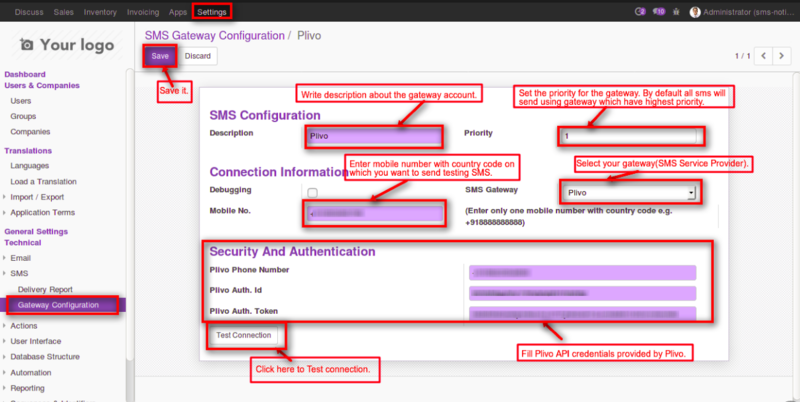 How to configure a Plivo Gateway. To configure the access right to a particular user it is must to enable the Enable SMS feature under users tab. Create and edit SMS Template. Template access globally. Edit Sms template defines the name to set it as global if you wish you can also enable auto delete option and finally save the content. Set template for particular conditions. Also, select the condition on which you want to send SMS using this template. To set groups to send messages, click on SMS group tab under SMS menu. Under SMS> SMS group tab you can define Group name, member type and members to send messages. To send the message click on SMS menu> send SMS where you can select to whom you want to send a message, what message you want to send, etc. Send SMS to SMS groups or multiple members or individual(s) using Template. Track and see the status of all the sent SMS. Here are all the supported SMS gateways. Need to purchase one of the SMS gateways with the base module (SMS notification) to send SMS.